Phuket sailing day trips and tours would have to rate as one of the best things to do in Phuket. And there is no one better to offer you an unforgettable day then the team at SweetDreamers. Igor and Delphine the operators of SweetDreamers will welcome you aboard their sailing boat, “Nadezhda” for a sailing experience in Phuket you will never forget. SweetDreamers offers a personalized sailing experience that fellow travelers rave about. You just need to read the reviews to find out why it is rated in the Top 10 things to do in Phuket on Tripadvisor. 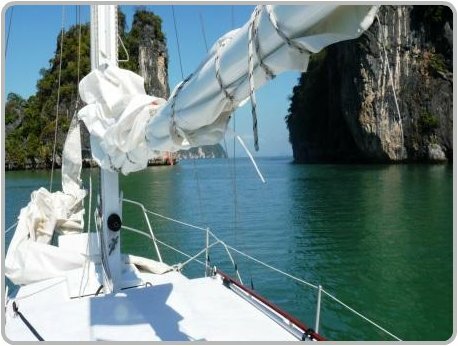 Their sailing tours will take you to some of the best snorkeling spots as well as exploring the amazing islands around Phuket including Phang Nga Bay and relaxing on secluded beaches. Forget the overcrowded speed boat day trips! Onboard the "Nadezhda" you will be assured a relaxing day in an intimate atmosphere. SweetDreamers only allows 6 guests plus crew aboard their boat, with a fantastic slogan “Come on board as a customer and leave us as our friend”. SweetDreamers is based at Chalong, just south of Phuket Town. It is here that many boats depart for day trips and tours to the islands around Phuket, including Raya Yai, Coral island, Phi Phi Don, Phi Phi Ley and Phang Nga Bay. SweetDreamers offer a variety of different tours, from the popular day trip or sunset cruise to private yacht charter and overnight island hopper tours. For a day trip to remember, sail with captain Igor to Coral island, stopping on the way at Lone Island or Bon Island for snorkeling, jumping off the boat and exploring the island. After lunch the sailing tour continues to Coral Island. Coral Island offers beautiful white sandy beaches, crystal clear water and many wonderful corals with a big variety of undersea wildlife. One of the highlights of this sailing trip is sunset. 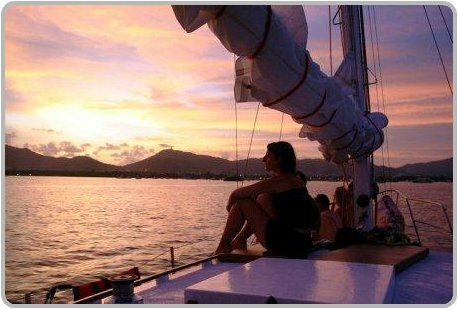 You can experience the sunset from the sailing yacht, while you are sailing along the Phuket coast. This is just a small introduction for one of the sailing trips, that SweetDreamers have on offer. SweetDreamers also offers other tours, like the private yacht charter, where you share the boat between you and your friends and sail to the islands of your choice. You can make your own program and decide where to stop and what to do. SweetDreamers Phuket sailing cruises give you the opportunity to enjoy a unique experience that you will always remember and with their very friendly crew you will feel you like your at home. At the end of the day there will be no crew and customers just friends. 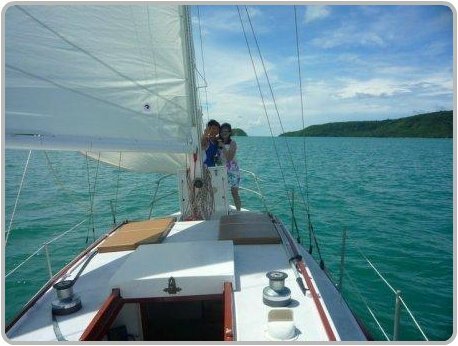 Contact SweetDreamers so you to can enjoy one of the best Phuket sailing experiences this magic island of Phuket has to offer.